I qualified as a Veterinary Nurse from Abbeydale Vetlink in Monmouth in 2014. 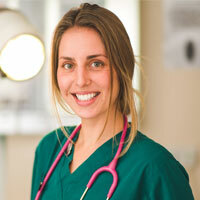 I am interested in all aspects of veterinary nursing and particularly enjoy nurse clinics and in-patient care. I also run our puppy socialisation classes here at Wellpets. In my spare time I am kept super busy looking after all of the animals on the farm, including our lovely dogs – (Bow, Spot, Tom, Pip, Floss, Ted and Midge).